If you would like more info on any of these planned litters, or if you would like to be on our waiting list, please contact us through our contact page. Puppies Raised At ASD Kennels Our mothers and their puppies enjoy first class service here at ASD Kennels. Once we know one of our girls is pregnant, they spend their time in our custom designed Maternity Cabin. Our cabin consists of individual whelping suites, which are sanitized with non-toxic, earth/pet friendly cleaners, are temperature controlled, music is heard to get them used to human voices and each have a separate indoor/outdoor area. Each room is painted, trimmed and full of pictures as if it were a room in our home, so they feel at home. The first two weeks of the puppies lives are solely spent with their mom, as she is busy feeding and cleaning them. We check on mom and the puppies several times a day, and throughout the night, to make sure everyone is strong and healthy. We make sure mom has plenty of Food and water as she needs a lot of nourishment to keep her pups fed and healthy. She is also let out several times to get a short break and some much needed play time in. On day three, our wonderful vet, Mary Rose, examines each puppy and removes the dew claws and docks the tails (tails on the Weims and Vizslas only), which is so important in hunting dogs. Around the tenth day, the puppies will begin to peek. By the fourteenth day, they will all have their eyes open and their hearing starts to develop. During weeks three and four, as they are beginning to move around, they are involved in several play times throughout the day inside and outside of their whelping suites This is a time for them to explore and learn how to play with each other. They are also involved with a lot of human interaction from kids to adults. This is so important for their physical and mental growth. This is also the time we start to introduce puppy food to them. We do this process slowly so that it does not disrupt their digestive systems. It also gives mom a chance to spend a little more time away from them. They are also wormed for the first time. During weeks five and six, they will become completely weaned from their mother. They will continue to receive wormings and at six weeks, they will receive their first round of puppy shots. They receive more play time, more activites and are able to explore even more. We will introduce them to bird scent and bird wings to bring out the hunter in them. A lot of them will go to hunting homes and others will go to homes to just be family companions. This allows us to match the puppies up to their new families. During weeks seven and eight, the time finally arrives for the puppies to go to their new homes! 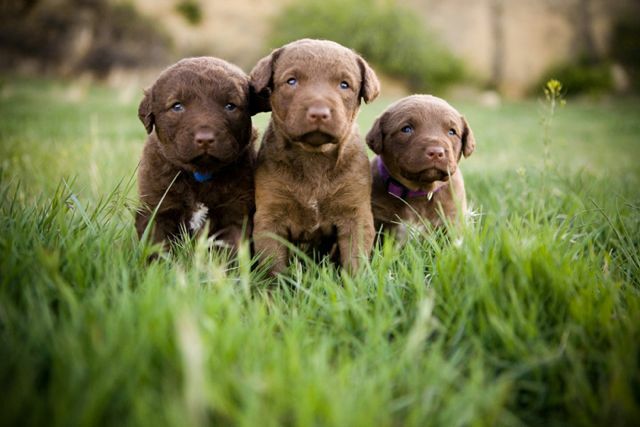 Puppies can leave around 7-8 weeks if they are picked up or delivered, and can leave at 8 weeks if they are to fly. We are happy to keep the puppies here for as long as you need us, but we do start charging $25/day to board once they turn 8 weeks. We anticipate this time so much as we are so excited to meet our new ASD families, sometimes for the first time. Those that we are unable to meet, we truly miss this time, but do what we can to get to know each other over the phone and thru email and pictures. Delivery Options: We offer several different delivery options for your puppy if you are unable to come to pick them up. We welcome anyone to come and visit at any time. All you have to do is call or email to set up an appointment. We love visitors, as do our dogs! If you plan to fly in, we will arrange to either pick you up at the airport, or we can even meet you at the airport with your puppy if you are unable to stay. The fee to fly with your puppy is usually between $75-150. You will need a carrier that will fit under your seat and a health certificate to fly-which we will get for you. Your puppy will need to be at least 8 weeks old to fly. We will drive your puppy anywhere, whether it be to your home, halfway from us to you, or anywhere else you would like. We will charge a delivery fee to cover our fuel and other expenses if needed. Contact us for specific prices. We will ship your puppy to any major airport in the United States or Canada as soon as they turn 8 weeks old. This process is made as simple and comfortable for all involved. We will make all the arrangements for you and all you have to do is show up at the airport to pick up your puppy. Shipping fees vary, but usually run between $400-$450, and include the ticket, travel crate and health certificate required for them to fly. We have shipped many puppies and are well known at the airport! They take excellent care of our puppies from the time they leave us until the time they arrive at your destination. They are kept in a climate controlled area in the plane, which is pressurized just like the main cabin. We will require payment in full 2 weeks before we will ship your puppy. For those who are unable to make the trip, and may still feel unsure about sending their puppy on the airplane alone, we would be happy to personally fly with the puppy in the main cabin and will deliver the puppy to your front door, or at your airport. Please contact us for prices on this. What’s included with each puppy? *AKC Limited Registration, with the option of Full Registration for additional fee. *Written 2 year Health Guarantee, for reassurance that you are getting a wonderfully healthy pup. To reserve a puppy, a started dog, or to get on our waiting list, we require a deposit of $200, which is non-refundable, but is transferable between any litter/started dog we have in the future. Pick of our litters goes in the order of deposits received. We reserve the right to have pick of the litter at all times, although we may not always choose to do so. At times, we will sell out of our puppies before they are born, so the earlier you get your deposit in, the better chances you have of getting a pup from the litter you desire. Please feel free to contact us anytime through our contact page. We would love to hear from you and answer any questions you may have!